Utilizing the design of magnetic holder, which brings more stable and convenient charging performance during the driving. No more tangled cables and just put your phone to start charge. The amazing user experience will make you love it. Easy to adjust to any angles to meet your visual needs when watching movies, playing games while charging your phone wirelessly. Compact and lightweight design to make it convenient for use in multiple locations. -Lenovo Moto Z, Yota phone 2 and etc. Compatibility - Compatible with most QI-enabled devices like iPhone X, iPhone 8/ 8 Plus, Samsung Galaxy Note 8, S8, S8 Plus, S7, S7 edge, S6, S6 edge, S6 edge plus, Note 5, Google Nexus 4/5/6 and etc. You would not be troubled by Micro and Apple Ligntning cables any more. Magnetic & Adjustable Stand - Strong magnetic power to fix the phone firmly and have no effect to the phone signal. A thin magnetic matel ring offered to strengthen magnet power. Designed to charge your phone quickly and easily once it is placed into the holder. It can be 360 Degree rotated, easy to adjust to any desired angles to meet your visual needs. You can also use your phone as a GPS device for navigating. Wireless Charge - Charge your Qi-compatible devices, no need to plug your phone into a wall charger or USB port. 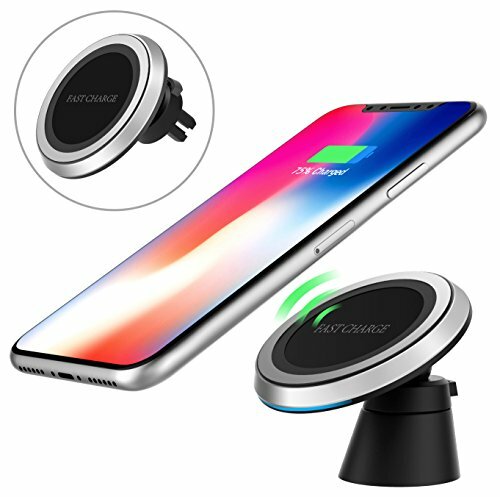 Fast & Convenient - When put your phone on the charger, this MoKo fast wireless charging pad will juice up your device from dead to full in just about 1-2 hours, which is 1.4 times faster than standard wireless charging pad. Kindly Note - Please use an AC Adapter with real 1.5A output. The input of the wireless charger is DC 5V 1.5A, insufficient input current may cause unstable charging. The coils were embedded in the middle of the charger. Generally speaking it can charge all QI mobile devices. However, sometions, the receiver coil in your phone is at the bottom and you have to adjust the position of your phone to get charged.